"Would Minecraft with Samaritan graphics be better? I think so." -Tony Tamasi, SVP Content & Technology at nVidia. A bold statement to make at the East Coast Game Conference (ECGC), but it does stir thought: as we approach evermore realistic visuals, when do we start hitting that wall of no-return? 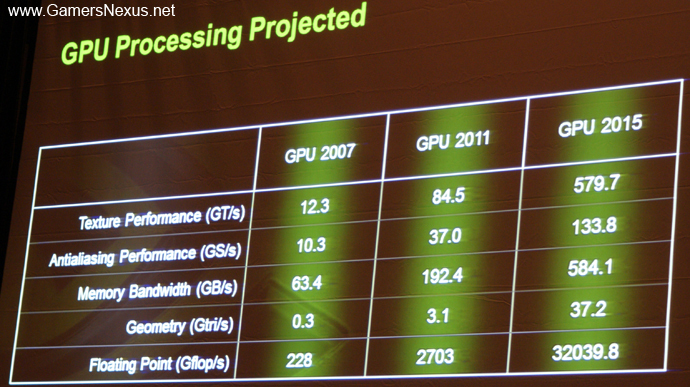 According to Tamasi, nVidia has real-time ray tracing, procedurally generated smoke, and video cards capable thereof on the horizon within the next five years. The technological advancements yield promising results for video game nerds everywhere (barring, perhaps, some competitive gamers -- as noted below), and some of the upcoming video card releases will be a dozen times more powerful than existing tech. Ray tracing is the technology responsible for producing realistic shadowing and shading within multimedia imagery and film, and while it is presently too slow to use heavily in gaming, Tony Tamasi aims to remedy that within the coming years. 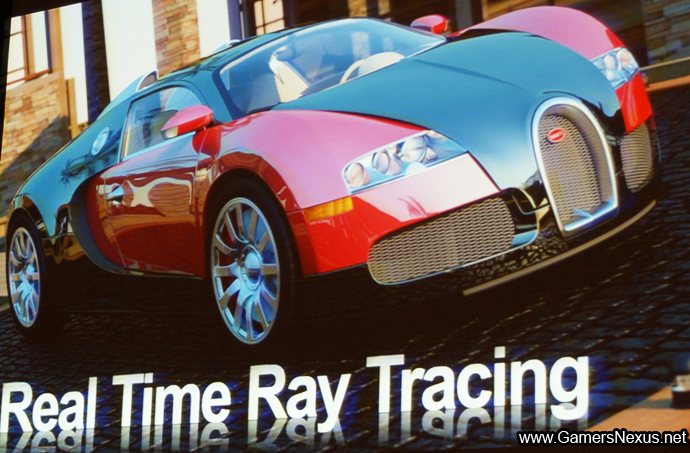 Real-time ray tracing will aid in removing sloppy anti-aliasing and choppy transitions between objects and shadows; it helps add a more effective color palette and increases realism within shadows and shading, but GPU limitations currently bar real-time rendering (as opposed to pre-rendering, like in movies). When we asked Mike Pickton, an aspiring 3D artist of the famed Baldur's Gate Redux mod team, about the implications of procedurally generated smoke, he told us the following: "Procedurally generated smoke will replace the spiraling 2-dimensional "particles" currently used to represent smoke. No more hard-lined smoke-meets-wall scenarios!" In effect, most current smoke grenades and other gassy effects are created by using several instances of smoke-like images that are interlaced to create the appearance of a swirling wall of smoke; of course, we've all seen the sudden chops in smoke clouds when they are near other surfaces. The graphical enhancements will, as mentioned by Tamasi, permit procedurally generated smoke alongside other similar advances, ensuring that gaming becomes an ever-growing medium of visual expression. "First person shooters are on the edge of coolness," said Tamasi at the conference, "and reality is a really, really hard thing to get right. We know what it looks like." It's been said before, but given the context of the discussion, he is absolutely correct. We are able to -- as both gamers and "real" people -- criticize things like smoke and shading technology because of our exposure to real-world environments where, of course, shadows and smoke originated. When playing cartoony games like Torchlight, however, it is much easier to overlook cell-shaded practices and any visual artifacts that could be passed off as "fitting of the theme." The inherent difficulty in reproducing actual environments within a 3D world has only spurred nVidia on to meet the challenge, urged Tamasi, "rapid iterations are the key to creativity." Wow. Those are some big numbers, and they all add up to what we see on the screen: immersive 3D environs and believable emotions emitted by its inhabitants. Despite most of our custom PC build recommendations being fueled by ATi/AMD cards at the lower range, nVidia still maintains a heavy foothold in the high-end department -- and, based on these images, that won't change anytime soon. 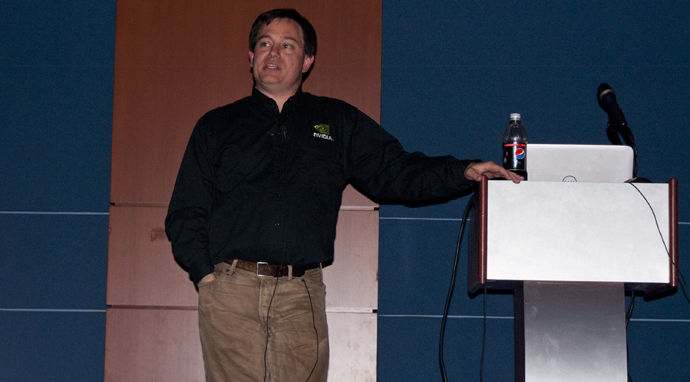 Tony Tamasi boasted that many of nVidia's modern GPUs are in fact faster than dual-core CPUs, and the demand for even faster GPUs is still high; games are becoming increasingly more graphics dependent, and the option to move typical CPU processes to a programmable chip on a video card promises to hasten the development of superior visuals and the rendering thereof. 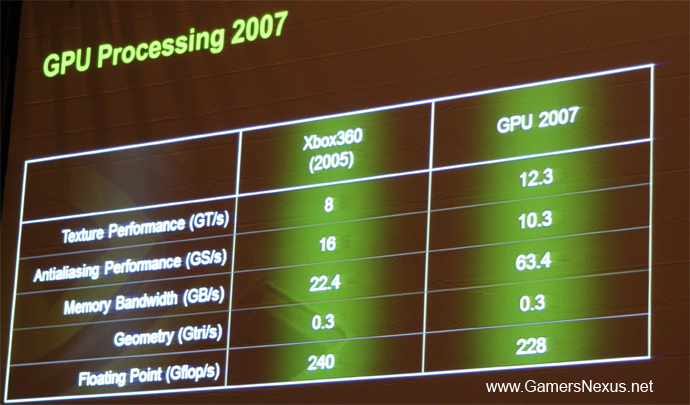 PC gaming hardware is in an entire class of its own when compared against current gen consoles; further still, when Tony drew comparisons between handheld devices (such as Apple's newest iPad iteration), he noted that the iPad 2 is currently only 25x slower than the Xbox 360, as opposed to the iPad 1 being some 250x 'slower.' It was in hopeful spirits that Tony stated his expectation of handheld devices "exceeding current-gen console performance within a few years." He continued on with the futuristic visions and, with wide-eyes, explained his hope for "all devices becoming one" sometime in the next decade (a bit over-zealous, if you ask us). Tamasi anticipates televisions, gaming computers, and consoles being replaced by a single, modular device akin in construction to modern handheld devices. A more recent advancement is the plan for polygons that are smaller than pixels being drawn in real-time (similar to what is possible in pre-rendered movies); the implications of this are many-fold, but some of the most immediate would be the standardization of a minimum anti-aliasing setting at 2x, up to 4x or even (as a stretch) 8x. Without a minimum of 2x anti-aliasing, from our research, it would not be possible to view the effect of the triangles on the pixels. According to Mike Pickton's knowledgebase, "imagine three lines of a triangle -- the lines will cut a pixel into two; in an ideal world, we want to show that pixel's color as representative of what's there. If the triangle covers 50% of the pixel and another triangle behind it is the remaining 50%, then we mix the two colors together. You'd need to sample at least the smaller-than-pixel triangle as well as something bigger behind it, hence the 2x minimum [anti-aliasing]." 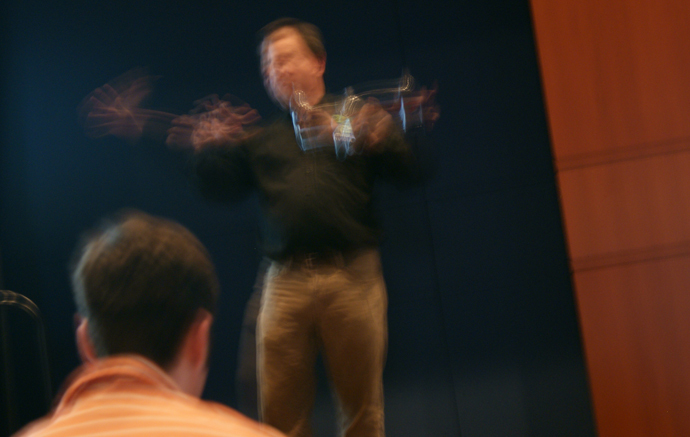 Tony Tamasi briefly mentioned the increase in depth-of-field expectations before allocating time to a mention competitive gaming and e-sports in his impressive keynote, stating mainly: "A competitive FPS gamer might not want depth of field. Turn all that stuff off and let me see who I'm killing!" He's correct -- many professional gamers (Spanishiwa of StarCraft 2 included) play on the lowest or additionally modded low settings (CoD4 being one of the most notable games to include removal of graphical enhancements); these gamers don't want additional overhead, as noted in the 3D discussion with nVidia previously, and hold winning as a primary objective: don't lag them down with fancy stuff. 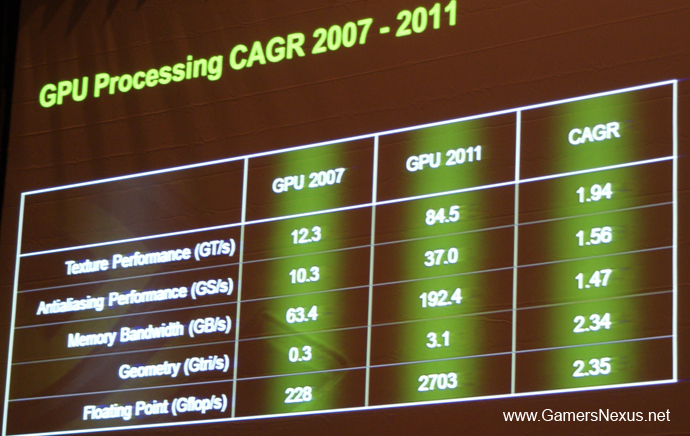 Of course, the improvement of video card technology (as seen in all the slides herein) will allow gamers to easily switch the fancy stuff on without fear of added overhead. The keynote as ECGC was absolutely the most educational lecture any of our on-site staff has attended -- Tamasi demonstrated superior knowledge of video and graphics technology, and although some of his predictions might seem outlandish, they were inspiring. What do you guys think? How likely are some of these goals to happen by 2015? Special thanks to Mike Pickton for his excellent explanation of 3D architecture.